Having been a wrestling fan off and on through the years, I feel the need to pay a bit of tribute to Eddie Guerrero, who passed away this week at the far-too-young age of 38. A lot of people dismiss professional wrestling as fake, and say that wrestlers aren't real athletes. Well, the outcomes of matches may be pre-determined, and championships may be awarded by committee rather than truly won by individuals, but make no mistake about it, these people are both athletes and performers in every sense of the word. The limits they push themselves to - physically and mentally - just to entertain a crowd are nothing short of astounding. And remember, there's no off-season in wrestling, so these men and women are out there almost every night of the year. A lifestyle like that often takes its toll. It certainly did in Eddie's case. At one time, he turned to alcohol and pills to help dull the physical and emotional turmoils he was suffering, and it almost cost him everything - his job, his family, his entire life. 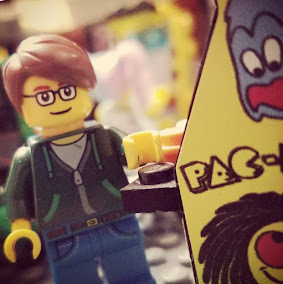 But he was able to turn that all around and come back even better than before, which is particularly impressive considering how great he was to begin with. For him to pass away after being clean and sober for four years... that's just so heartbreaking. 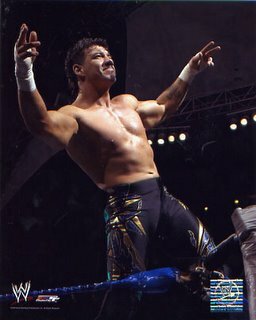 Eddie Guerrero was a fantastic athlete (he had the best frog splash in the business), a master showman (face or heel, you couldn't wait to see what he'd do or say next), and judging by the many testimonials I've seen on television and online, he was about as universally loved by everyone whose lives he touched (in person and in the ring) as is humanly possible. In the eyes of anyone who knew him, or merely watched him wrestle, he will always be a true champion. Rest in peace, Eddie. Viva la raza.